One of the fears people have about raw feeding is balancing their dog’s diet. 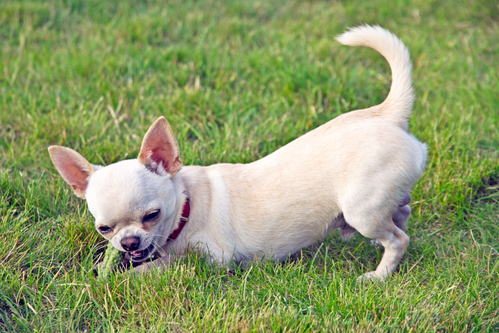 I’m going to share an easy way to ensure that your dog’s diet is balanced. It involves math so get your calculator. Not interested in doing math? Don’t worry, I offer two easy solutions that don’t involve a calculator. There are two main models of raw feeding: BARF (biologically appropriate raw food) Model and Prey Model. 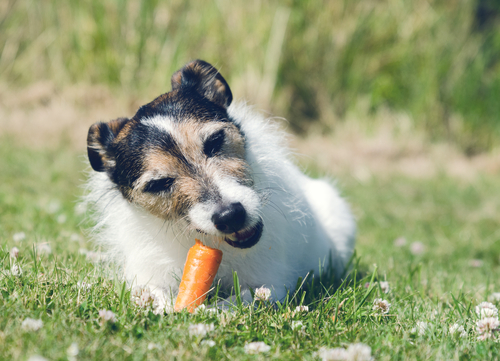 Those of us who feed our dogs based on the BARF Model believe that fruits and vegetables have a place in our dogs’ nutrition. Prey Model raw feeders see fruits and vegetables as unnecessary. This seemed easy at first and then I wondered “how do I figure out how much ’10% organ meat’ weighs?” I’m an accountant by day, so it was fun to figure out a simple calculation to help me out. In the below example, I’m going to show you how I create a balanced raw meal starting with 15 pounds of meat and no bone. 15 pounds / 0.80 = 18.75 pounds is the total weight of your meal when you’re finished when you’re also adding bone. However, in this example, we are using a meal balancer in place of bone so you’ll see that your total weight is only being used to calculate how much offal you need. 18.75 pounds x 0.05 = 0.94 pounds (if you’re using a digital scale, you can easily come to this weight). This is the easiest step, you’ll have 0.94 pounds of liver. Please note that this number changes when you account for your meal balancer. 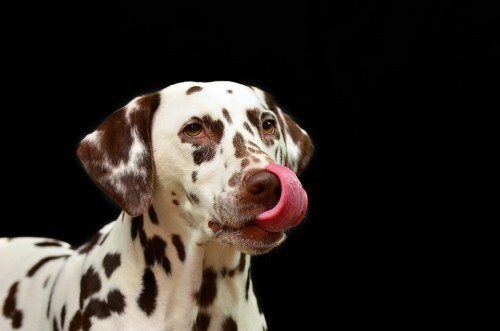 Because you don’t have bone, you’ll need to use a balancing mix to account for the missing calcium in your dog’s diet. Depending on the balancing mix you chose, you may have to adjust the amount of liver you add to avoid too much Vitamin A. With Petabolics offered by Natura Petz, I recommend cutting the liver amount by 50% from 0.94 pounds to 0.47 pounds. With the Kindly base mix by The Honest Kitchen, I recommend cutting the liver amount by 50% from 0.94 pounds to 0.47 pounds. When using a meal balancer, it’s also important to read the ingredients to avoid duplicating supplements. For instance, if the meal balancer already accounts for kelp, don’t add more to your dog’s raw meal. Petabolics contains iodine and Kindley contains kelp. Follow the instructions on the meal balancer to determine how much to add to your meat, organ meat, and liver. If math isn’t your thing, don’t click away – stay with this post for an easier way to balance your dog’s raw meals. In the below example, I’m going to show you how I create a balanced raw meal starting with 15 pounds of duck wings and bone. In this example, you will have to add more muscle and organ meat for this to be a balanced diet. We’ll figure out the amount in Step Four. First, figure out how much meat and how much bone comprises a duck wing. PerfectlyRawsome.com has an amazing chart that helps break this down. 11.44 pounds x 0.05 = 0.57 pounds (if you’re using a digital scale, you can easily come to this weight). This is the easiest step, you’ll have 0.57 pounds of liver. 11.44 pounds x 0.10 = 1.14 pounds of raw bone; however, you have 5.85 pounds of raw bone and you can’t separate it out to use later. 5 pounds of raw dog food x 0.80 = 46.8 pounds of muscle meat – 9.15 pounds calculated above, you’ll need an additional 37.65 pounds of meat. I add turkey scapula meat that I order through our raw food co-op and grind at home. Sometimes I’ll also add turkey heart, but not too much (about 5 pounds) because it’s a bit rich. 5 pounds of raw dog food x 0.10 = 5.85 pounds of organ meat, half of which is liver. 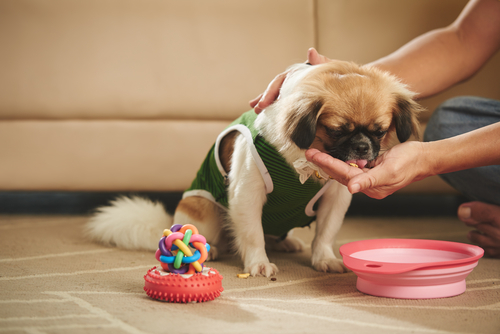 If your brain is melting and you’re thinking “does raw feeding require this much math?” then CLICK HERE to learn an easier way to feed your dog a balanced raw meal. I wish someone would have told me this in the beginning. Remember, CLICK HERE, to learn an easy way to balance your dog’s diet. Hint: Scroll to the end.